Yavne, Israel - Under the slogan of “Unleashing the Power of Paper” at drupa 2016, in Hall 9, C50, Highcon reveals an entire world of applications that can be achieved by their digital finishing customers. 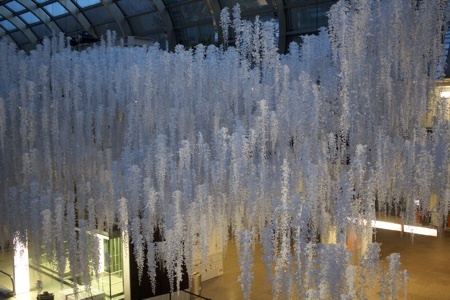 From traditional print applications such as folders and packages to paper fashion, large format display items, and all the way to 3D models made of paper. Even before reaching the company’s booth, in the North entrance and in the drupa cube in Hall 6, visitors can see the amazing results made possible with Highcon’s technology. These spectacular displays, designed by Highcon Euclid digital cutting and machine on Arjowiggins Maine M1 paper. When first Wanda Barcelona, were produced by Highcon Wanda display at drupa north entrance customer Maison Lack by DLW on their approached by the Messe Dusseldorf to produce their eye-catching displays, planned to be the hallmark of drupa 2016, Wanda were hesitant – they saw no way they could produce the kind of scale required. The collaboration with Highcon resulted in this truly memorable vision combining unique design elements that needed to be produced at an industrial pace. The surprise unveiling at the show is of the Highcon Shape 3D machine. Designed by Padwa Design, renowned industrial product and car designers, this is a technology preview of Highcon’s new machine, implementing its Rapid Layer Manufacturing Technology aimed at transforming the 3D print world from rapid production to rapid manufacturing. 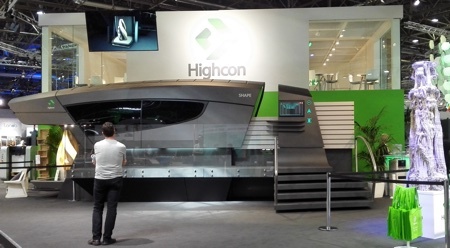 The Highcon Shape, envisaged for release in drupa 2019, will deliver real life, large scale products from a file to reality, within minutes, using any kind of paper. This machine will produce products at high speeds and at costs that are unmatched by any 3D printing technology. The result is a truly revolutionary process to produce everyday items, such as furniture, which can be customized and personalized, and models for industrial use. Previously announced at Highcon’s pre-drupa event, the Highcon portfolio of products will be running throughout the show on the booth. They will showcase compatibility with a large range of partners, from offset press manufacturers, and also B2 and B1 digital printing companies. ? The Highcon Beam taking B1/42 in digital cutting and creasing into mainstream production with up to 5000 B1 sheets per hour. The Highcon Euclid III - third generation proven digital cutting and creasing machine with improved capabilities, quality and performance and brand new Variable Data Cutting and 3D Modeling.